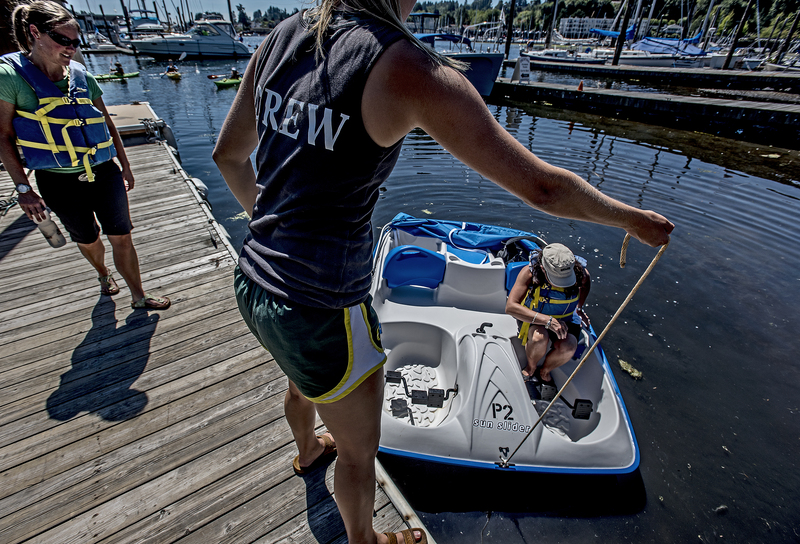 A crew member at the boat rental place by the Peninsula Yacht Basin helps my lovely bride aboard the paddle boat. 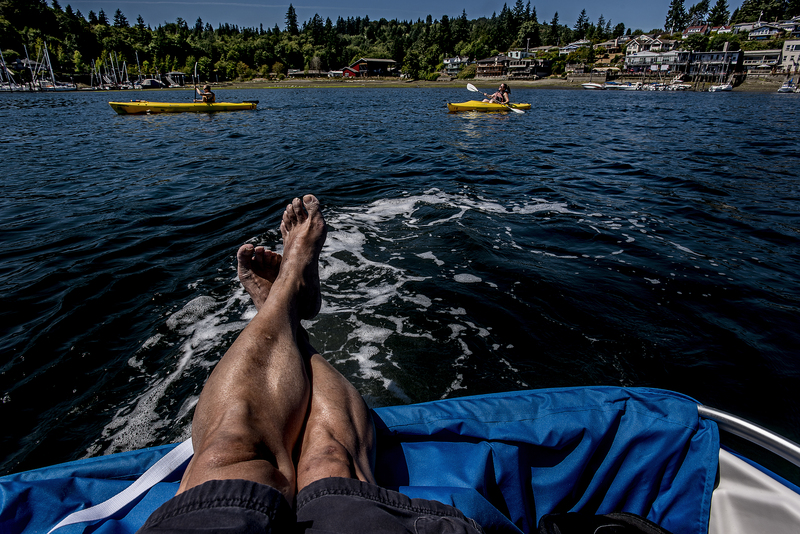 Sitting in the back of the paddle boat with my feet up soaking in the sun and the view of others on the water. Judging from the cloud cover over Drayton Passage, things are cooling off a bit today. But not enough to lift the heat advisory. According to the National Weather Service, our high today will be 89 degrees. It is 66 just after 8:30 a.m.
Slather on the sunscreen folks and we might as well enjoy the heat. My lovely bride’s daughter Adrienne surprised her yesterday with an excursion out on the water in Gig Harbor Bay — on a paddle boat. What an intimate workout experience on the water for three. Factor in the heat index with temperatures topping 90 degrees, this was not for the faint of heart or legs. We started out with my lovely bride and Adrienne paddling us out into the bay. I sat in the back, feet up, and soaking in the rays. Not a bad deal from where I was sitting. A gentleman, who cruised past us in a 35-foot Sea Ray Sundancer, apparently agreed. “Living the dream,” I said. Stay cool and have a great morning Longbranch. 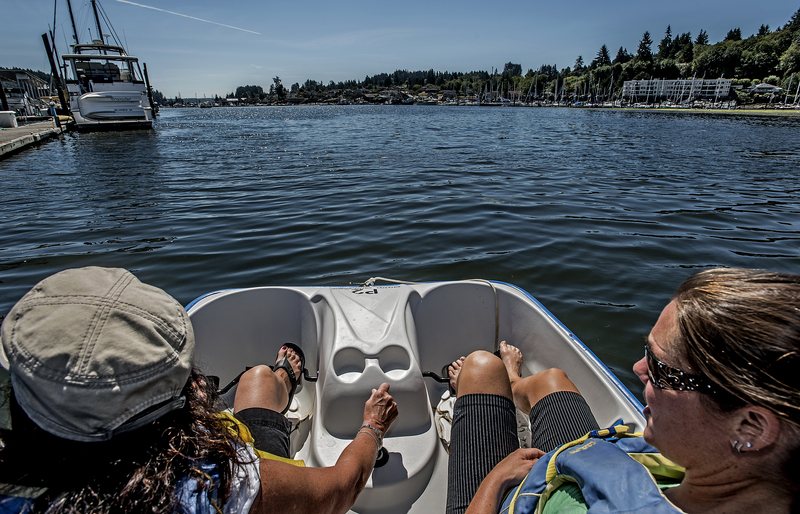 Paddling out into Gig Harbor Bay with the Peninsula Yacht Basin on the left. Best place to be during a Puget Sound summer is on the Harbor!